EXCEPTIONAL MEETING with Caterpillar around the range CG 132, CG 170, CG 260. An event organized by Eneria to discover the Caterpillar plant and a biogas recovery site in Mannheim, Germany. 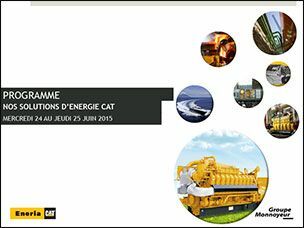 Eneria will host a conference with Caterpillar officials, offering to you the opportunity to talk directly with the manufacturer. Specialist energy solutions from generators, offers a gas genset range from 130 kWe to 4.3 MW. Our Caterpillar gas generator range is adjusted to all type of gas: Natural, mines, landfills, biogas, synthesis to meet your needs. With many features, they can produce electricity, hot water, steam cold, warm air. A complete mastery of work on the supply to the plant with guaranteed results up to commissioning. A local network to ensure the maintenance of your installations and ensure the profitability of your investments. You are carrying a project? Come and meet the experts Eneria and Caterpillar in Mannheim and get the best advice and solutions to meet your needs. Share the post "Discover new energy solutions of Biogas and Cogeneration – Mannheim 24-25 June 2015"